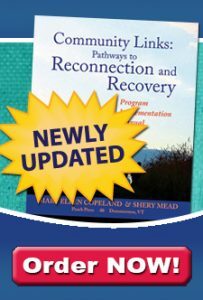 I am often encouraged by being a facilitator of the Wellness Recovery Action Plan (WRAP). In the six years of facilitating WRAP in a Mental Health Center setting I have seen many different faces of people that enter my class. I have seen the anxious faces; they feel scared and not sure what to think of the class. I have seen the bored face – the one who is so sick of going to groups and feel they get nothing out of them. I have seen the suspicious face. This face seems to be saying “ok who are you and what are you going to tell me that someone else hasn’t said already?” I have seen the faces of the downhearted – the ones who feel sick and tired of being sick and tired. The different faces seemed to have one thing in common. That common factor is hopelessness. But something happens in the WRAP classes that encourage me to stay at the peak of wellness with my own mental health issues. This something happens as I tell the story of Mary Ellen Copeland. When I begin class, I explain that the WRAP program was developed by Mary Ellen Copeland and tell the story of Kate, her mother, who came out of a long 8 yr stay in a institution and went on to a very productive life. I start seeing heads go up and eyes turn toward me. I continue to explain that Mary Ellen Copeland also had mental health issues and wanted recovery from those issues. I further explain how she struggled with getting the answers to her recovery from the providers she was seeing. People in the room would become more alert and some would start to move up closer stating they wanted to hear better. As I explained that WRAP was developed with others who have or had mental health issues and that I myself have a mental illness, something awesome begins to happen. As I look around the room faces start to change. The anxious seemed to relax. The bored seemed interested. The suspicious seemed more comfortable. The downhearted seemed to be hanging on every word. Among the change in the faces I notice another common factor begin to show. This common factor is the something that I said encourages me to stay well. It helps me to have strong visions of the possibilities of mental health recovery and recovery from catastrophic effects that mental illness can cause. This something I see in the faces around me. This something has changed the faces of millions with mental health issues. This something is Hope!